Chicago; a progressive city that celebrates diversity and creativity. Being a true melting pot of so many different cultures, Chicago offers an impressive variety in the realm of cocktails and cuisine. Some of the best bars I have visited in the United States have been in Chicago. There are stunning rooftop bars and unique speakeasy style bars sprinkled throughout the city. Chicago has come a long way from her tumultuous past dating back to her resistance during prohibition, to an incredible beverage scene today. Chicago is always evolving and growing. The locals are outgoing and welcoming and they know what a well crafted cocktail is. There are endless things to do in Chicago, with a night out on the town being a must! This post offers 10 of the best bars in Chicago that you can’t miss during your next trip to the Windy City. Raised bar is one of the best bars in Chicago if you’re looking for a rooftop spot. This swanky bar in the Renaissance Hotel has a beautiful view of The River North Neighborhood of Downtown Chicago. You can sit inside in rustic but elegant couches or venture out to enjoy cocktails in the open air and watch the boats pass by. If you have a larger party, consider renting one of the cabanas for added privacy. Raised Bar also offers delicious small bites to compliment the impressive cocktail selection. 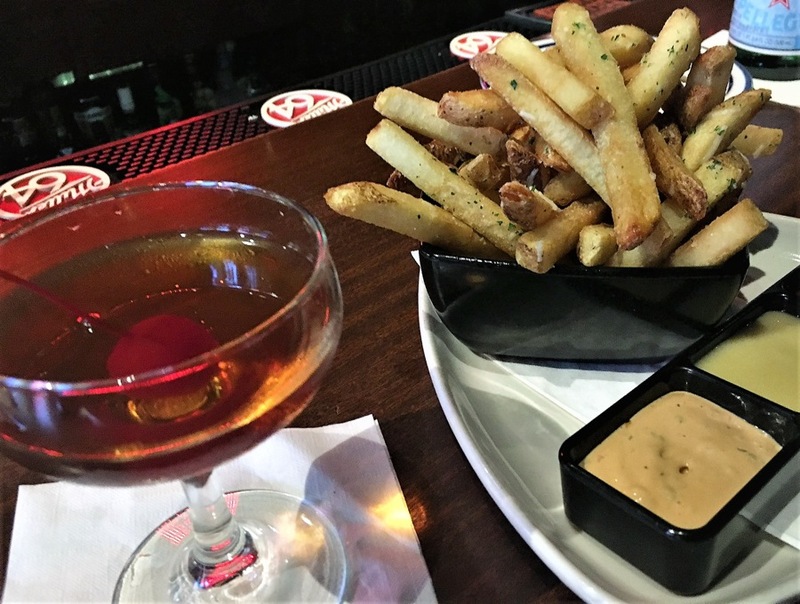 Must try: The Truffle Frites and the Raised Burger, both are perfectly seasoned and a great compliment to the bold flavors in the cocktails. To drink you have to try the beautiful and Instagram worthy Watered Flowers and for something refreshing and bright order the Thai’d Up. Cindy’s is Chicago’s other must see rooftop bar and one of the best bars in Chicago. Set atop the Chicago Athletic Association, this rooftop bar offers incredible views of Millennium Park and the harbor. Cindy’s is definitely a bar to dress to impress. The cocktail menu is presented in homage to the old apothecary. Drinks are artfully crafted to layer unique flavors and can introduce you to spirits you may not find in every bar. Must try: The menu celebrates the season, so offerings will rotate. Cindy’s offers brunch on the weekends and the Avocado Toast is one of the best. For the perfect elixir, try the Leila and Siempre, Si for the ideal antidote to cure whatever may ail you. Prices: Cocktails and glasses of wine range from $14-$26. Food will range $14-$36 for Brunch and Lunch offerings, while an impressive dinner menu with locally sourced foods will range $14 to over $70. 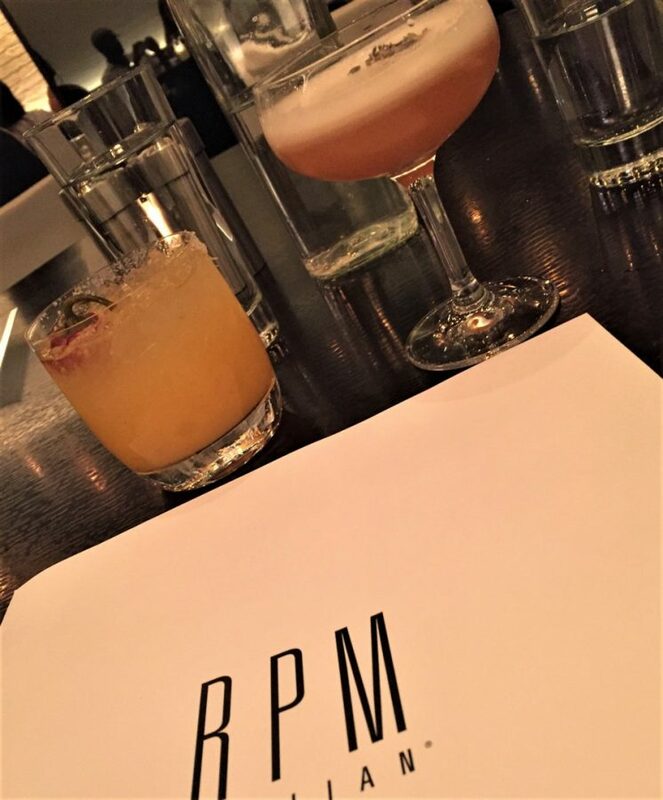 It was late, our flight was delayed, and I was starving and travel worn…but I wanted good food and a cocktail or three…RPM Italian was ready to welcome me in. Pristine modern white decor with elegant swanky details that liken the top VIP lounges of South Beach. RPM Italian was impeccable. The drinks were creative and beautifully presented. RPM Italian is one of Chicago’s best bars for a modern swanky environment and truly an ideal spot for a special date or celebration in the heart of Chicago’s River North neighborhood. The bar was packed until close with an engaging bar team that created Instagram worthy drinks non-stop. The ambiance floats from the bar into the whole restaurant. Being exhausted from travel I was glad to be seated in a plush booth that offered a little more privacy. Both RPM Italian and RPM Steakhouse are two of the best places to eat in Chicago. Must Try: The Spritz & Giggles cocktail was refreshing and the name made me smile. There is also a carefully edited wine list to compliment the Italian inspired cuisine. For dinner, the Black Truffle Beef Tartare is an absolute must. To this day, this remains one of the best Steak Tartare dishes I have ever had. Bavette’s is definitely one of the best bars in Chicago. Dark and romantic, this Parisian inspired location is lavish and moody with an impressive menu for both delicious cuisine and impeccable cocktails in Downtown Chicago’s River West neighborhood. At the back of the restaurant is a nondescript staircase dimly lit by candles that transports you back into time. Sneak below ground to this subterranean bar with jazz music and truly amazing cocktails for a prohibition era experience. Must try: Since Bavette’s is a steakhouse, try the Tenderloin Steak Tartare and the Roasted Bone Marrow. To compliment the ambiance the Gimlet was refreshing, but one of the best cocktails I’ve had was the Tokyo Old Fashioned. Prices: Cocktails range from $11-$20 with an impressive Whiskey assortment offered by the glass ranging $10-$80+. The dinner menu offers small plates for $14-$28 and meals $26+. The Tortoise Supper Club sweeps you back into time and surrounds you with opulence and carefully curated pieces dating back as far as the late 1800s. This club is one of the best bars in Chicago for its elegance, hospitality and ambiance. The owners Keene and Megan have been very hands on and celebrate their love for Chicago and her history. On the weekends the Tortoise Supper Club offers live jazz music which adds to appeal of this dark swanky spot. The Tortoise Supper Club also offers incredible specials like $1 oysters weekdays 4:30-6:30. The bar fills up quickly on the weekends with live music. I highly recommend a reservation to ensure you have a seat to enjoy the live music, great cocktails and delicious cuisine. Must try: The Tortoise Supper Club has an impressive Whiskey and Wine list, but also procures well crafted cocktails with my favorite being the classic Aviation. For dinner start with the Grilled Octopus and Miso Brioche Rolls, then enjoy any of the main courses that feature locally sourced beef. Make sure to try their adult milkshake, The Grasshopper to compliment your desert! Prices: Cocktails start at $13 while wines by the glass will range $12-$25. Cuisine appetizers and small plates range $7-$22 and entrees $28+. Andy’s is my pick for one of the best bars in Chicago for live Jazz music. The environment is comfortable and unpretentious respecting the clubs roots as a getaway for the working class dating back to the 70’s as the go to spot for employees of the newspaper business. Over the years, Andy’s has offered live Jazz music and has become a staple in the Chicago market for one of the best bars in Chicago for live music nightly. Andy’s typically hosts at least two bands per evening with a calendar posted on their site so you can plan ahead to catch your favorite artists. Andy’s is a very popular location in Chicago, so there is a two-hour limit on a table, however the bar area is always first come first served. Must try: Andy’s offers popular cocktails and a fully stocked bar with well-known beer and wine labels too. For dinner, the menu will update regularly however a staple that has remained on the menu is the delicious Andy’s Burger. Prices: Cocktails start around $13 with beer and wine options from $6-$25. The dinner menu offers bar bites and full entrees ranging from $6-$31. Step away from the bustle of Downtown Chicago and into the eclectic neighborhood of Chicago’s Gold Coast and into one of the most beautiful spots in Chicago to gather with friends for a glass of wine. While the 3 Arts Club Café isn’t a true bar, this charming Café is absolutely beautiful and surrounds you and your friends in sheer elegance while you sip your wine and enjoy the company. 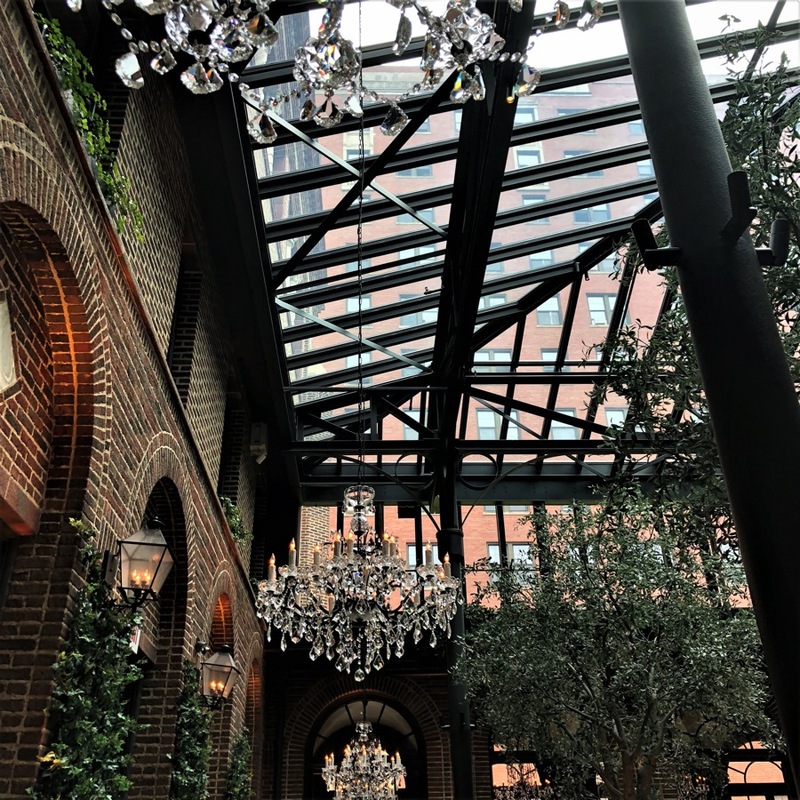 Set inside Restoration Hardware, the building originally was a public house for women artists, the 3 Arts Club Café is nestled in the common area where the ladies would gather for meals or just to hang out. The 3 Arts Club Café is definitely one of Chicago’s best places for wine and ambiance. Must try: The 3 Arts Club Café offers a delicious Bellini that pairs beautifully with any plate you choose. From the menu the Truffled Grilled Cheese is incredible and for dessert indulge and order a fresh-baked served warm Chocolate Chip Cookie. Prices: Wines by the glass start at $13. Breakfast, lunch or early dinner options range $12-$29. 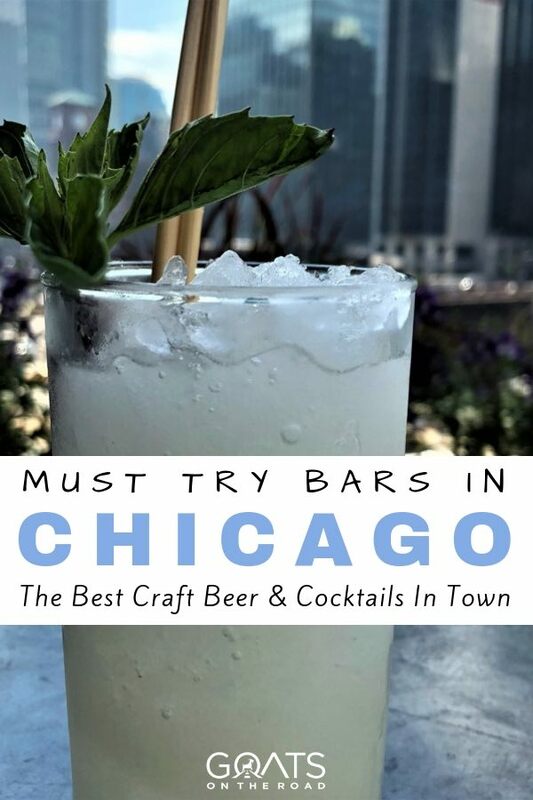 At one point your travels in Chicago are certain to take you near or along the Magnificent Mile, and when you do…stop and have a cocktail or beer and bite to eat at The Purple Pig. 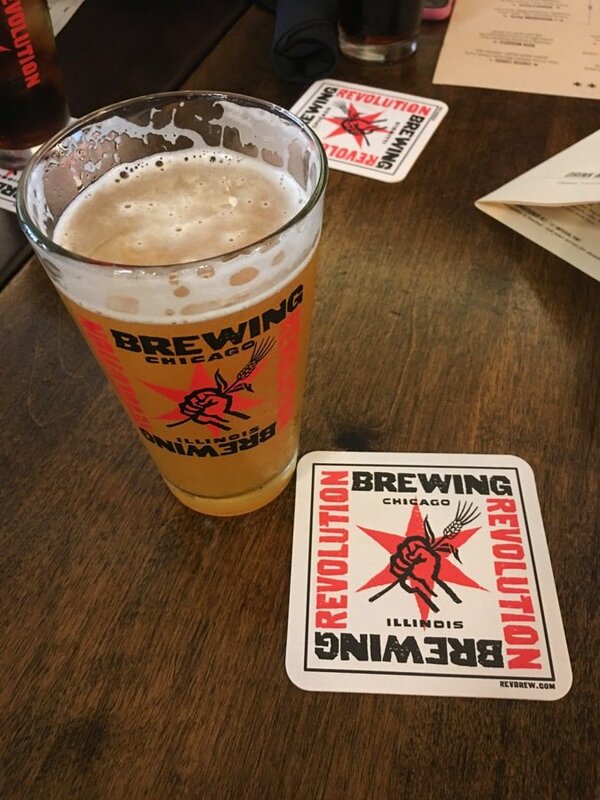 This local favorite spot hosts several Illinois Beers and a menu that updates based on seasonal finds and all located steps from the shops along Michigan Ave., making The Purple Pig the best bar in Chicago for an afternoon break from shopping and sightseeing. Just finished the Chicago Architecture River Cruise? Head over to the Purple Pig for a drink! The ambiance is casual and rustic and the cocktails and cuisine are thoughtfully prepared and artfully presented. Must try: The Purple Pig menu changes often but trust the Chef and Chicago’s love affair with beef and pork, if the bone marrow is available, that is a definite! The cocktail menu changes frequently too. The bar team at Purple Pig truly knows how to craft well layered cocktails, but they also celebrate local breweries, so consider something regional. Prices: Cocktails start at $12 with an impressive Whiskey list for single pours ranging from $12-$50+. Beers range $7-$13+. Small plates will range between $9-$23 and main dishes from $26+. Cocktails need not only be enjoyed in the evening. Cochon Voulant is an absolutely delicious spot in the Loop neighborhood of Chicago and is one of the best bars in Chicago for brunch. Cochon Voulant offers a warm ambiance with a modern Parisian twist. Cochon Voulant is also close to the theaters, so this is a great bar to plan to visit for cocktails or dinner before your show. At night Cochon Voulant is dark and moody with tasty bar bites to compliment well crafted cocktails. Must try: As stated above, Weekend Brunch! The Monsieur Foster Waffles are decadent. If dining in the evening order a slice of #thickcutbacon… it’s a great bite to compliment Cochon Voulant’s classic cocktail The Old Fashioned. Prices: Cocktails start at $14. Brunch plates start at $13. Small plates from the bar start at $9 and evening dinner plates start at $16. 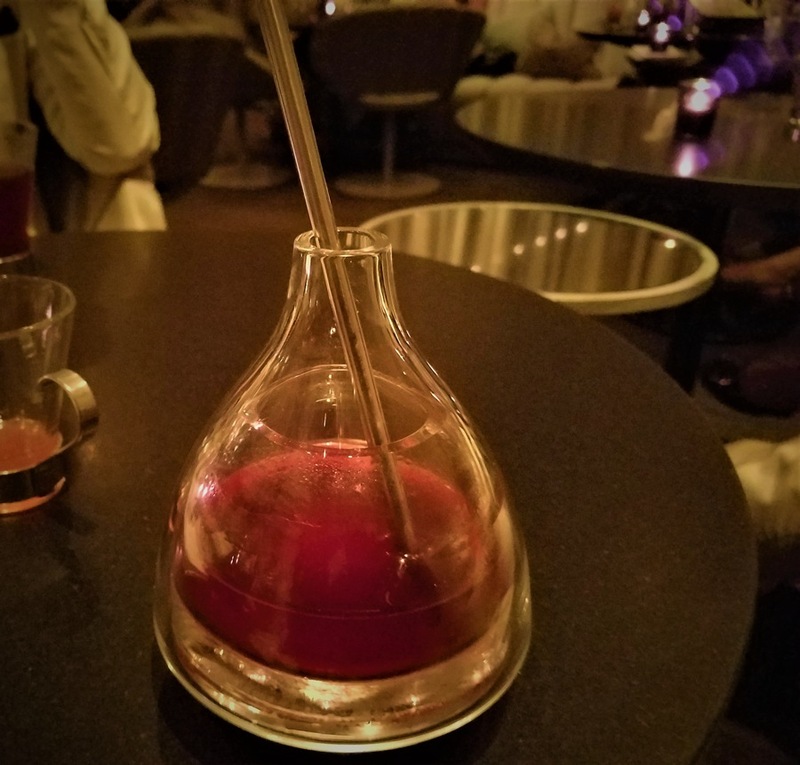 Every true cocktail lover has at least heard of The Aviary. This visionary spot has ‘raised the bar’ in creative delivery and presentation of cocktails (pun intended). The ambiance is clean and modern, with a trendy vibe. The Aviary is not a place to visit to sip a beer or try your first cocktail. Their creations are often complex and priced in respect of unique spirits and custom tinctures. Reservations are a must, often being booked for months in advance on weekends and holidays. The Aviary is an experience. 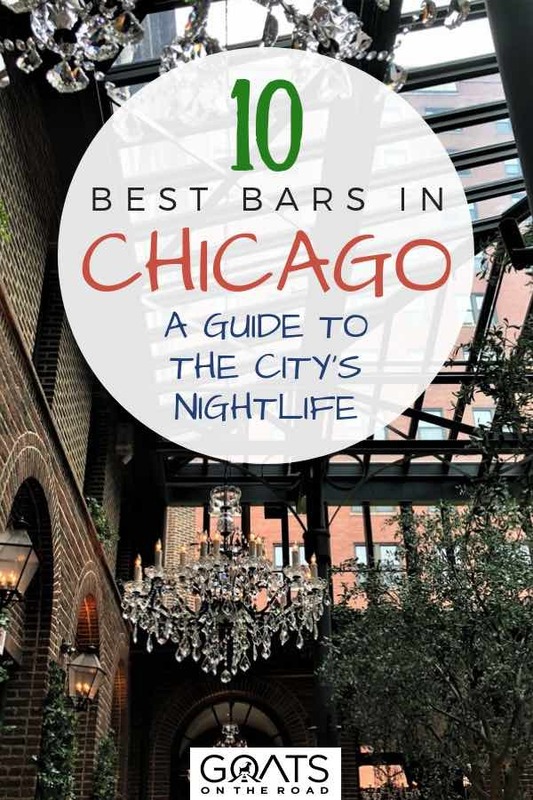 It is not only ranked among the best bars in Chicago but the best bars in the United States! 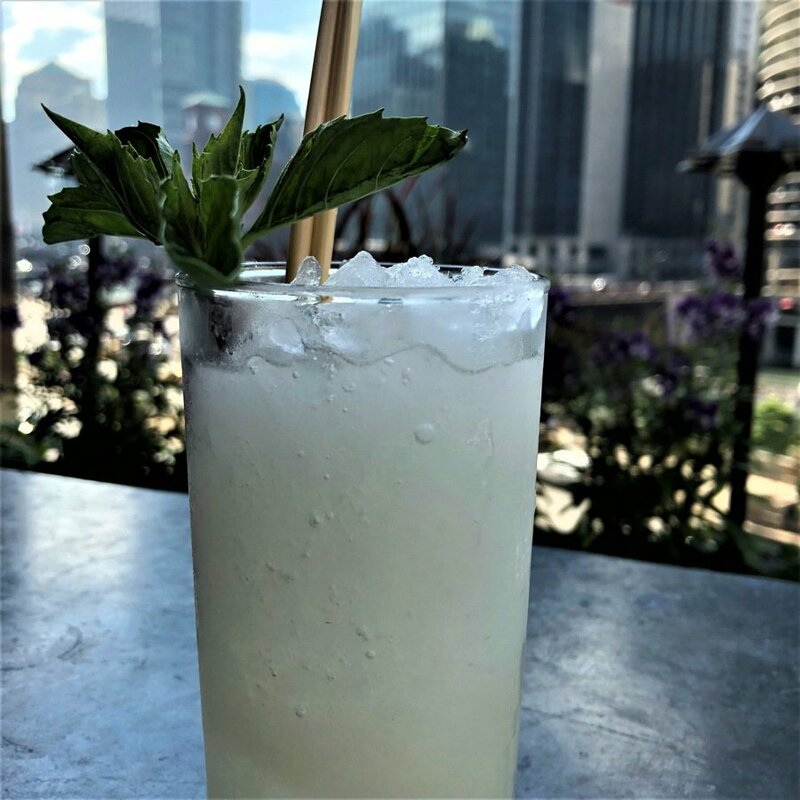 If your visit to Chicago allows, set a reservation for The Aviary earlier in the evening when they first open around 5pm or 6pm before the bar fills up. The Aviary is on the outskirts of the West Loop neighborhood, so you may need to plan to arrange for a ride to and from. Must Try: Everything. Is. Stunning. Have your phone charged and be ready to snap endless photos of your cocktails and cocktails passing you by to another party. Prices: Cocktails range $18-$25+. The Aviary also offers small bites equally artfully presented that range $11-$25. 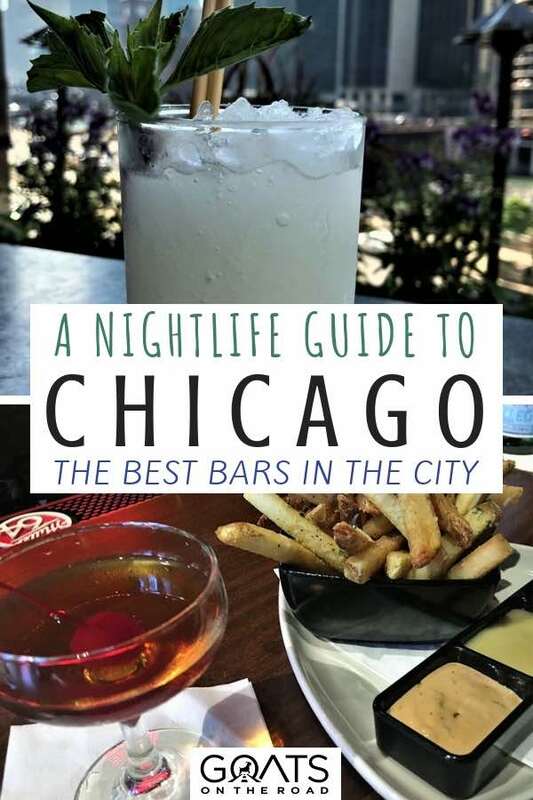 Ready to Enjoy a Night Out at The Best Bars in Chicago?! Chicago is full of stunning locations to sip and savor this incredible city. 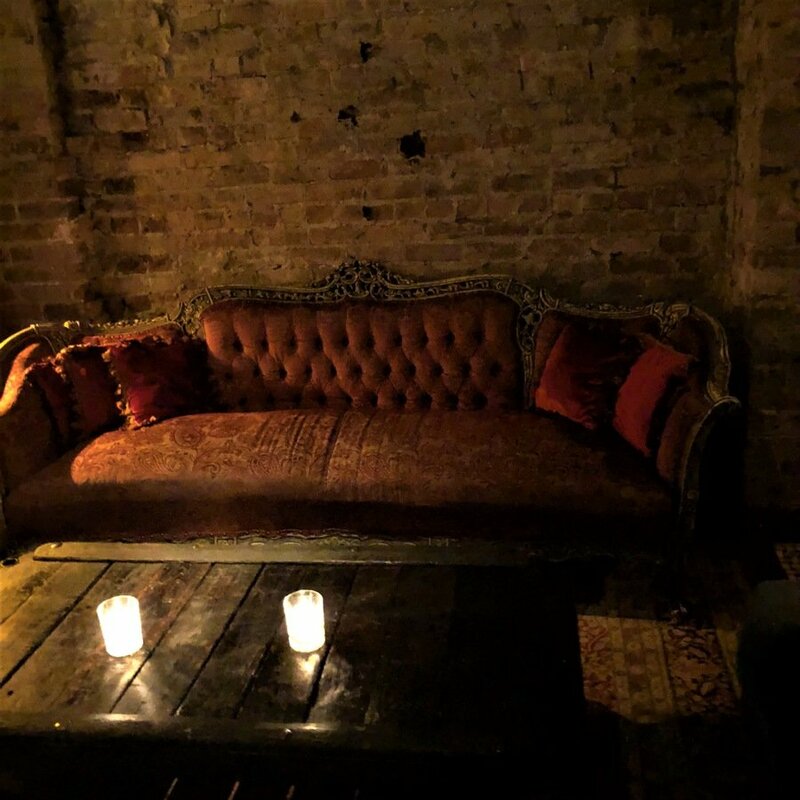 As a progressive growing metropolis, there will be new spots evolving but over my years visiting The Windy City, these 10 locations have well-earned the title of Best Bars in Chicago for their unique contribution to the city’s ambiance and mood.